This large tree frog has many interesting adaptations and is known by many different names! From its abilities to defend itself to its parachuting ability, this is one interesting amphibian! The Veined Tree Frog, a true tree frog in the family Hylidae, is characterized by its large size, with a snout-to-vent length of up to 11+ cm! It has a robust body with thick glandular skin on its dorsum. It is generally gray to tan on its dorsum, but can be yellowish or even reddish. Many individuals have an extensive dark dorsal patch and distinct banding on the legs. Its ventral surface is creamy white to pale brown, with a slightly darker throat. Its eyes are medium-sized and have a gold iris with black flecks. It has a distinct, rather large tympanum. Its fingers are short and robust with large discs, and are only moderately webbed. Its toes have extensive webbing. Males have a tan nuptial pad on the base of the thumb (but no spines, as in some other species). 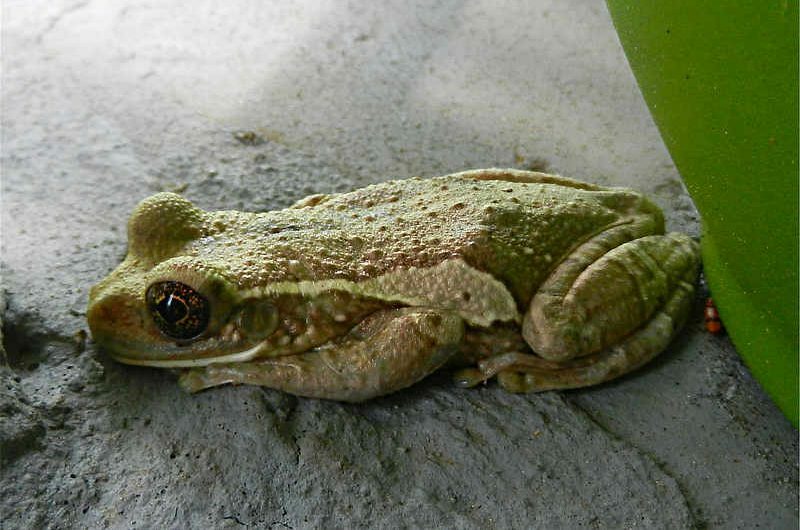 The Veined Tree Frog is a nocturnal, arboreal, canopy-dwelling species. At night, they perch on branches and vegetation to forage. During the dry season, they can be found in bromeliads, holes in trees, under bark, or in banana or Heliconia sheaths in order to stay moist. In the rainy season, they are usually found near temporary ponds. Veined Tree Frogs breed early in the rainy season, after heavy rains. Breeding takes place in temporary ponds. Males call to females while floating in the pond, a loud, repeated growl. During calling, males inflate their paired vocal sacs on either side of their head. After amplexus, the female lays eggs in a sprawling film on the surface of the water. Their development is relatively fast; eggs hatch after 1 day. Tadpoles grow up to 4 cm and are oval-shaped with a moderately long tail. They are predominantly brown with a long, dark stripe that extends from the snout to the tail. Tadpoles have very large gills, an adaptation to living in warm, oxygen-depleted ponds, to maximize oxygen uptake. They also have large lungs. The tadpoles eat algae, which they scrape from the surface in small ponds. They begin to metamorphose at 37 days, and take 10 days to complete the process to the adult stage. One must take caution in handling Veined Tree Frogs—when distressed, they exude a noxious, milky secretion from glands in their skin. Effects of the secretions include sneezing, skin irritation, swelling, pain and more serious effects including temporary blindness. The secretions are one means of deterring predators, but are also produced heavily in the dry season as a means of avoiding desiccation—the glands that produce these secretions are far more pronounced in the dry season. Widespread and common throughout tropical America from Mexico to northern Argentina (and also present on Trinidad and Tobago), this species known to inhabit a wide variety of habitats, including subtropical and tropical dry forests, humid rainforests, scrublands, grasslands, rivers, lakes, ponds, marshes, plantations, rural gardens, urban areas and heavily degraded former forest. It is found primarily in the lowlands, but is known up to 1600 m in some parts of its range and even up to 2500 m in Guatemala. These frogs may be encountered around all of the Canopy Family lodges, especially during the rainy season. Cool Fact! Veined Tree Frogs have a highly developed ability to parachute from trees, and have been observed gliding for 27 meters! Many names: The Veined Tree Frog is also known as the Common Milk Frog and Milky Tree Frog. In Belize it is known as Pepper Tree Frog because it can cause sneezing!